← On Research: Dive Deep or Swim Around? 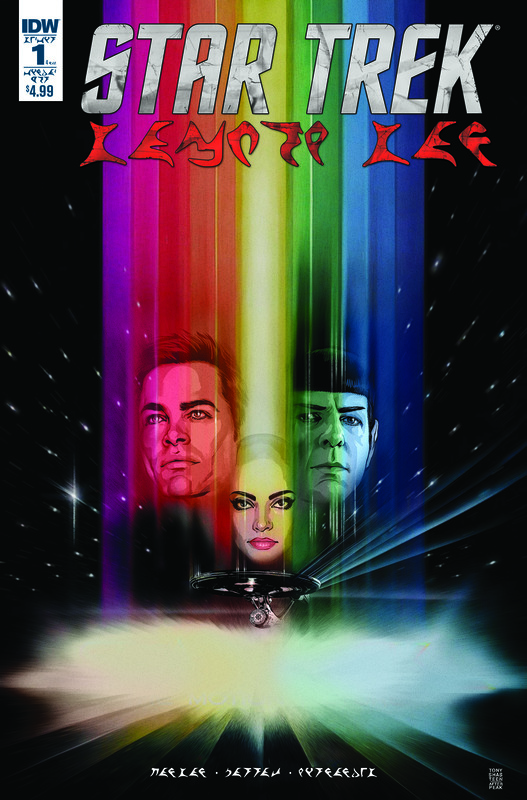 Prior to the release of each of the new Trek films IDW has released a four-issue “Countdown” series. The first Star Trek: Countdown fleshed out the character of Nero and tied the universes of old Star Trek canon with the Abrams-verse*. Countdown to Darkness, perhaps in part because it couldn’t reveal anything about Khan, is a weaker tale of Robert April still implausibly being able to use his old command codes to take over the Enterprise. Its only tie to the movie is Mudd’s ship from “The Mudd Incident” i.e. Countdown to Darkness. While Manifest Destiny isn’t explicitly a countdown series, it’s doing some of the same work of setting the tone for the new movie. It seems a little odd that this was split off as its own tale, as what we’re really getting is another continuing adventure of the Pine-Kirk crew following Issue #54 of the Ongoing series. 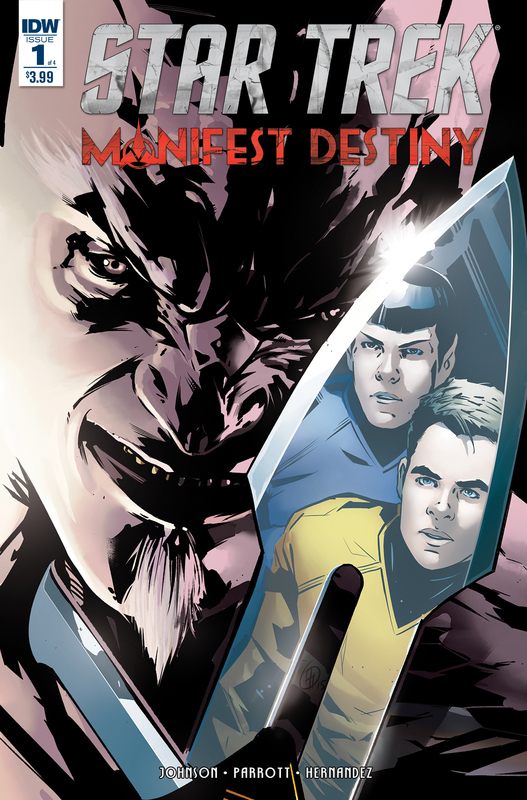 While Manifest Destiny was running, Issues #55-58 of Ongoing had its own mini-series, Legacy of Spock, following the events of Prime Spock between 2009 Trek and Into Darkness (incidentally this is the tale the earlier Spock: Reflections wishes it could have been). It would have made more sense to me to have Manifest Destiny as part of Ongoing, and to split off the Spock tale separately, but such are the vagaries of the comics industry. 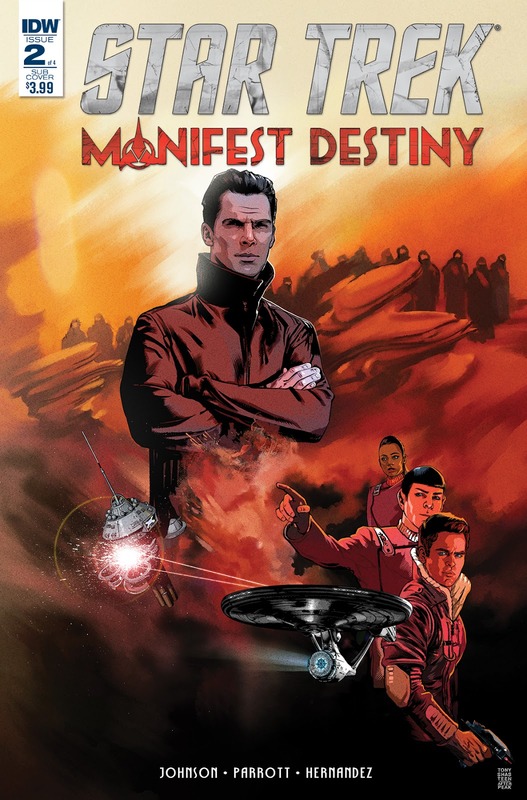 As for the plot of Manifest Destiny it follows a light-skinned Klingon commander named Sho’Tokh (not the albino from “Blood Oath“, I checked) who is determined to seek glory at any cost, especially the cost of his own men. After luring the Enterprise in with a fake distress call, he begins an all out assault on the ship including a battle directly on the hull to gain entry (always cool in my book). 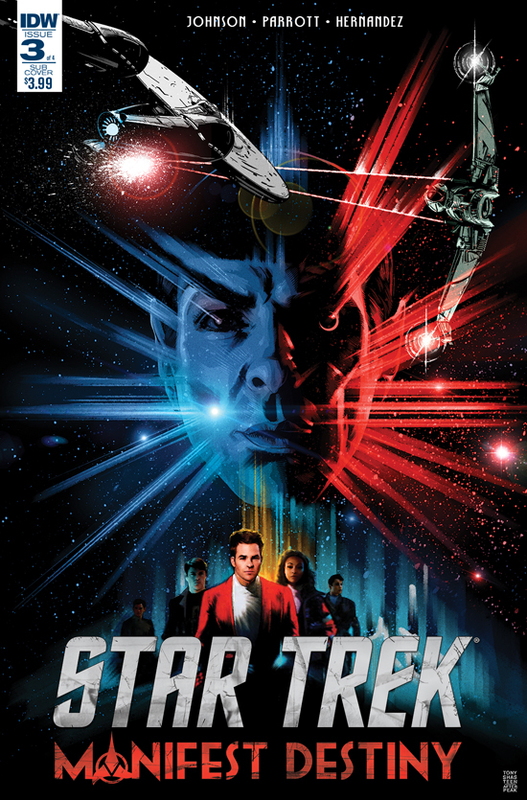 The majority of the tale is spent with Kirk and crew fighting the Klingons from within the Enterprise, while McCoy, Uhura, and Sulu are captured by the Klingon crew. Turns out the Klingons aren’t too happy with their commander’s tactics, with letting them be killed and all, and want the Enterprise crew to help them defeat Sho’Tokh before he gets them all killed. 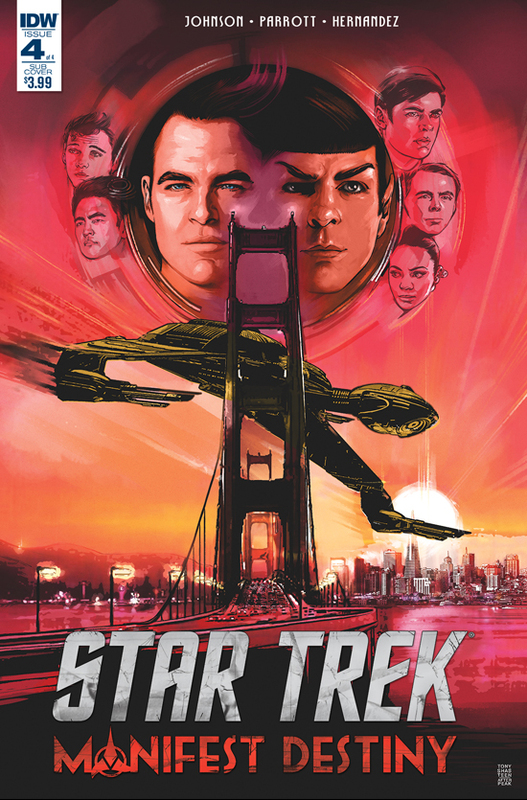 IDW’s Trek tales have never had problems with the visuals. We get good likenesses of the whole crew, great Klingon ship designs that are a blend of new movie sensibilities and classic design, and the Enterprise looks as good or better than it does on screen. The fight scene on the hull of the ship is too closely drawn to feel like we’re out in space, and I don’t think the Bat’leth needed a redesign, but that’s a taste thing. I’ve never been a fan of the Klingons from Into Darkness, but I do get that they’re trying to blend what we saw in Next Gen with TOS sensibilities. The story is serviceable, and sets up a tale of Kirk’s ship being overwhelmed by a superior and determined force which we’ll probably be seeing in Beyond as well. There’s a through-line of McCoy being disgusted with some old attitudes, then discovering that some Klingons aren’t just interested in killing, but this isn’t consistently handled. We do see McCoy and Uhura being capable in a fight which is always good. The attack itself is brutal, tearing apart the ship and crew. We lose a character whose tale we were just served in #53-54 of Ongoing and Klingons are at their most animistic and brutal. We forget sometimes with the TNG and DS9 Klingons that they are a warrior race who have a killer nature. Not so here. In some ways this tale makes me wish that Klingons would have been a bigger threat in the movies than they actually are. Sho’Tokh is a little one-note, a little expository at weird moments, and undone largely by cowardice, but other Klingons are drawn with a sense of honor. Kudos to the person who included all the Klingon swearing (there were a few really deep cuts). Also we do see enough of Klingon medicine to know we would rather be treated at a bus-station. There’s also a Klingon variant which is basically just another way to get you to spend money unless you’re really a geek. Overall the series is worth a look as part of getting yourself in the mood for the new movie. *I am aware of the term Kelvin-verse and refuse to use it. ** Note: I received issue 1 from NetGalley in exchange for an honest review. Since I’m a collector, I now have all 4 and this review covers the whole series.